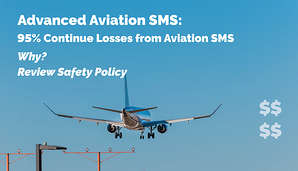 For every aviation safety management system (SMS), the accountable executive must ensure the SMS is properly implemented and performing in all areas of the organization. To achieve this end, safety management teams work to ensure that all personnel participate in the aviation SMS. Wishes and reality are two different ideas. The reality is that most employees care about the SMS about as much as the company's traditional safety program. little information passed between management regarding hazards and the efficacy of risk controls. Reading and acknowledging important safety communications. Does Management Really Want Employee SMS Participation? How can the accountable executive be assured that all employees are involved in the SMS? Before you read further, a question to ask is "Does the accountable executive really want SMS participation?" This is a fair question to ask, because a small subset of companies are interested in standing up a "paper SMS" designed to simply "check the SMS compliance" box. Yes, I understand this will raise some eyebrows, but I've never been a "politically correct" type of person. There are parts of the world that regulatory oversight is inadequate and a "paper SMS" remains a valid business decision. Furthermore, there are aviation industry segments that are not as heavily scrutinized for SMS compliance as are the major airlines. So while there are valid business reasons to implement a paper SMS, I'm guessing your SMS does not fall into this category. Otherwise, you would not be reading an article about improving aviation SMS participation. How to Measure Employee Participation in Aviation SMS? How many safety newsletters have been published (for safety promotion)? How many days does it take to push reported safety issues through the risk management process? Is the number of overdue safety tasks increasing or decreasing? What are the top hazards affecting operations? Another way to measure SMS performance is by monitoring whether "employees are actually involved in their SMS." The Logins By Division chart is an extremely valuable tool for assessing which employee segments are participating in the aviation SMS, and which sections are not. The precondition of this chart is that the SMS must have a modern data management strategy that goes beyond simple spreadsheets. To efficiently track employee behaviors, you will need aviation SMS database software or a computer server that can track user activity. We will show how to create this chart. We also discuss how to uncover some insights that may help you increase employee activity within the SMS. You will notice this chart is called "Logins by Division." Divisions are a way to logically organize SMS data according to how an organization operates, either functionally or by region. Divisions are how organizations using the SMS Pro database group users and data in the SMS database. The concept of "divisions" affords security and a way to isolate data from other organizational units. Divisions are commonly different departments or different organizational locations. For more information about division in a safety program, see these articles discussing what divisions are in aviation SMS. Out of the total number of users in each division. Or directly participating in the SMS. The main concern for safety managers and front-line employees alike is participation. Aviation safety cultures with involved employees tend to have high-quality risk management processes with healthy participation activity. The Logins By Division chart shows us exactly this: how involved employees are. Acts as a reference point for engagement levels vs perceived risk for each division. The last two points are rather subtle implications of this chart, but none the less are an invaluable tool for aviation safety managers. If managers see that one division, in particular, has substandard login activity, then they know that their safety promotional efforts need to be focused there. Safety managers can also compare aggregated risk of reported hazards against the level of involvement for each division – as involvement increases we would expect to see less risk with reported safety hazards. This chart displays meaningful data regarding employee participation levels as a whole and within each part of the organization – however, this data also hinges on WHO an organization’s users are. Are on leave of some kind. In other words, it’s possible that the total number of users is not an accurate reflection of the working number of users. Every organization will differ on this – it’s simply up to the safety managers to have a good idea of how many regular users there are in each division. The point here for safety managers is to ensure that you can explain the reason for any substandard performance activity, including login activity. As said, having access to this chart entails either a company-wide server that can track user logins or company-wide SMS database software that can track logins. Each employee in the SMS would have a unique username to login with, and the software would simply tally the unique number of user logins in the last 30 days out of the total number of users. Moreover, since this chart specifically shows us user logins per division, those numbers would be tallied for each division rather than the company as a whole. The reason that safety managers use common or generic usernames is to share the SMS software account with multiple users. Their reasons are usually financial, especially when SMS software companies charge subscription costs based on the number of employees in a company. To reduce costs, or to "game the system," safety managers create generic user accounts that do not track individual user access, but all user activity associated with the account. Therefore, if you have ten employees using the same account, this report does not accurately reflect the reality of the SMS' operations. Additional problems may surface when users share accounts. Consider for example that you want to track employee training using an SMS database. When ten different employees share an account, it becomes impossible to track each individual employee's training records in the SMS database. Another instance where problems occur are sending important safety messages through the SMS database. When ten users share the same account, all employees must be accessing the same email account for safety communications. To avoid these problems, best practices will have one user to each user account in the SMS database software. Otherwise, performance monitoring charts are not accurate. How Does This Chart Relate to SMS Requirements? Continuous Improvement: knowing who is participating in your safety program is critical for improving aviation SMS performance. In many ways, this chart is a powerful tool where in the organization the safety management needs to focus their safety efforts. Directly, this chart is most pertinent to the safety management - including safety managers and department heads. Both areas of management have direct oversight over cultivating employee involvement in the safety program - both in the program as a whole as in each division. Safety executives will want to ensure that the allotted safety budget is being used efficiently. There are several other charts that can expand the information found in the Logins By Division chart. 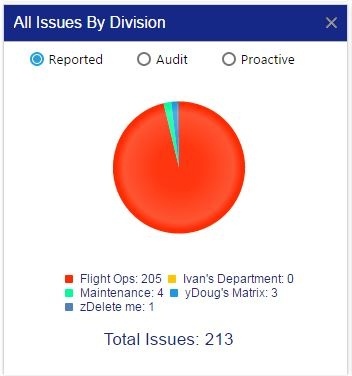 The first is the All Issues By Division chart, which shows the total number of reported issues within a specified time frame. This chart allows safety management to assess the quality of active users. In other words, a safety manager can verify that the number of Logins By Division corresponds to the reported issues from each division. 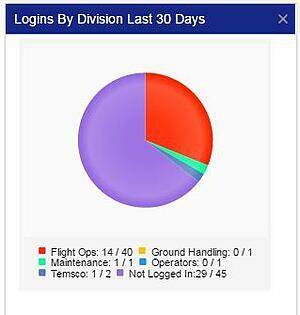 If logins are high, but reported numbers are low, then safety managers should investigate further. Likewise, if login numbers are low but a number of reported issues is unnaturally high, then that is an indication that only a few employees in that division are fairly involved. There are other creative ways in which safety management can correspond the two charts to find more useful information about their aviation safety management system, such as by looking at proactive issues or audit issues as they correspond to employee involvement in the SMS program for each division. Interested in learning about other safety charts? Every employee has safety responsibilities. How do you track whether all employees understand their duties and responsibilities toward safety? Do you need help? We believe a best practice for SMS is for all employees to understand their duties and responsibilities. This activity should be documented in your SMS. If you need help with your SMS, it may be you lack tools to effectively manage your SMS. Please watch these short demo videos to learn how you can benefit from using modern SMS database software. Do we seem like a good fit for you? 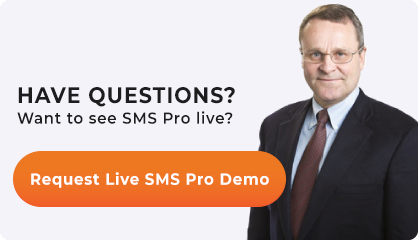 Want to see SMS Pro live? Sign up for a live demo. Originally posted May 2016. Last updated March 2019.